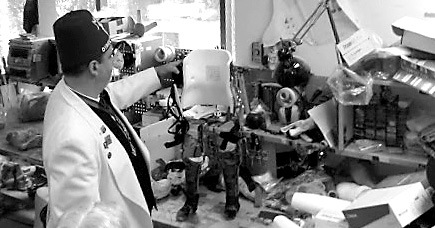 One of the local Masons visiting the Shriners Hospital in Springfield views a prosthetics lab where the devices are made and tweaked to fit individual children. Suffield and area Masons of Composite Lodge # 28 recently visited The Shriners Hospital for Children in Springfield. Lodge Master John Ledoux led a group of Masons and family members to the hospital to present Melha Shriner Donald Carberry a jar filled with soda can ‘tabs’. These tabs are then converted into cash as a donation to the hospital. What is not often known is that all Shriners are Masons! There are 22 hospitals throughout the United States. Three are for treatment of burns and 19 address crippled children’s medical problems. The one in Springfield was the third hospital built by Masons for these purposes. Thousands of children are treated in Springfield with state–of–the–art technology. Many of the braces, prosthetics and other accessories needed by these children are crafted in workshops on site. No child is ever refused care or treatment at a Shriners Children’s Hospital.